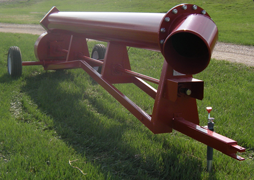 An Irrigation Contractor reported favorably on its 12" and 16" Trailer Pumps. August 2006. Tessman Brothers Irrigation, Warren, WI purchased a Crisafulli 16" humpback trailer pump and a Crisafulli 12" humpback trailer pump, and made the following observations: "The pumps were delivered on time, per specifications, and in good condition; the pumps were good value, performed as expected and met the customer's needs; the Crisafulli sales staff was knowledgeable about the pumps, and provided adequate technical information. In his buying decision, he felt these factors were important or very important: the pump's performance, product features, price, Crisafulli's warranty, overall quality of the product, Crisafulli's brand reputation, availability of after-sale service and support, and his comparisons of the Crisafulli pumps to other brands". Tessman rated these aspects of Crisafulli's customer service as excellent: employee friendliness and courtesy, employee product knowledge, and ease of purchasing and ordering.